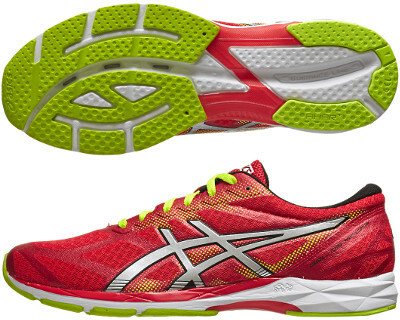 Asics Gel DS Racer 10 are stability racing running shoes. The Gel DS Racer 10 is the ideal racing flat for mild to moderate overpronators. About 10% lighter than its predecessor the Gel DS Racer 9 it provides a responsive and stable ride. This version has been completely redesigned: new lighter, more breathable and seamless enginereed mesh in the upper to increase comfort and avoid friction. Also features reflective material (on the heel and logo) from 3M to increase visibility under poor light conditions. In order to enhance support and stability a dual density foam (DuoMax®) is present in the midsole with the Solyte® material supplementing rearfoot GEL® responsible for acceptable cushioning. All mentioned materials represent the evolution through research from Asics improving their predecessors in durability, weight and responsiveness. Outsole becomes Magic Sole™ featuring more breathability through vented mid and outsole using AHAR+ rubber for better abrasion resistance increasing shoe's durability.